It was previously reported that The Legend of Zelda: Breath of the Wild would not be released in March like expected. However, GameStop is now suggesting that the title may release in March after all. As part of GameStop’s latest earnings report (via Gamespot), the retailer listed Breath of the Wild as one of the titles that the company is preparing for in the first quarter of 2017. The first quarter of 2017 would be January-March. 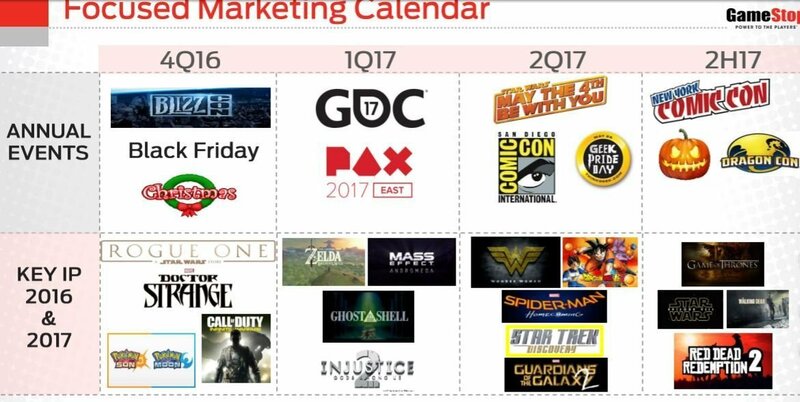 The slide where this information is mentioned is titled “Focused Marketing Calender.” This could mean that this will be the time that GameStop will begin marketing the products listed there. However, GameStop management did suggest that the properties listed on the slide pertains to when that product will be released. Last month, Nintendo Japan released nearly 40 minutes of gameplay from The Legend of Zelda: Breath of the Wild. In the gameplay, we get to see the game’s first boss, which appears to be a giant rock monster. The fight starts at around 33 minutes in. The boss one-shots the player, who then figures out that the monster’s weak spot is located on its back. The video also shows off Breath of the Wild’s cooking system, snowboarding, tree chopping, and hunting. The Legend of Zelda: Breath of the Wild will release in 2017.